Height 42", Width 26" OD, Weight 40 lbs. Colour yellow. Rebounding, stackable, easy to assemble. Octagon configuration, for more rebounding ability. 100% rust proof UV protected polyethylene. The Portable, Resilient Work Light! 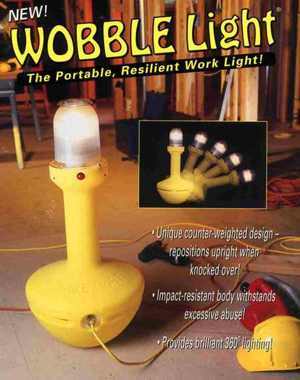 With its optically designed dome and 500-watt bulb, it transmits more even than 2x 600-watt portable work lights. Rugged and easy to maintain. Takes the abuse of the workplace and provides years of reliable service. -Height: 3 ft. -Width: 17 1/2" -Weight: 20 lbs. 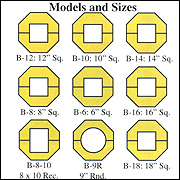 -Repositions upright when knocked over using its unique counter-weighed design. -500 watt double enveloped halogen light. -Bulb is protected by impact-absorbing floating shock system and bulletproof dome. 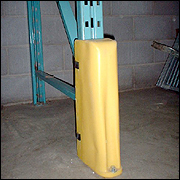 Protects and deflects: building corners, door frames, pallet racks. Rustproof, hollow construction, impact resistant. Height 40.5", Width 10" OD, Depth 6.5", Weight 6 lbs. Protects: walls, forklifts, hallways, guard rails. Height 48", Width 6.25", Thickness 2.25", Weight 6 lbs. 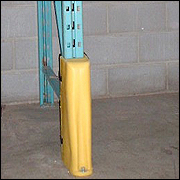 Stackable, virtually eliminates rack damage. Semi-flexible, crack-resistant plastic minimizes the force of tow motor impact. Bright safety yellow, UV stabilized. Easy to install, easily removable. 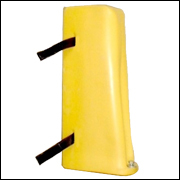 Polyethylene barricades for safety: Construction, Industrial, Parks and recreation. Fill with water or sand. Rust proof, lightweight, reflective bars. 4" fill cap, 2" drain. Semi-flexible, crack-resistant plastic foam padding absorbs the force. Quick, easy installation, perfect custom fit, easy removable, maintenance free. UV stabilized, bright safety yellow. 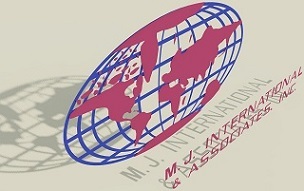 Copyright © M.J. INTERNATIONAL & ASSOCIATES Inc.